How to send SMS from a File of contacts. If you don’t want to use the contacts in your address book you can upload contacts from a file. 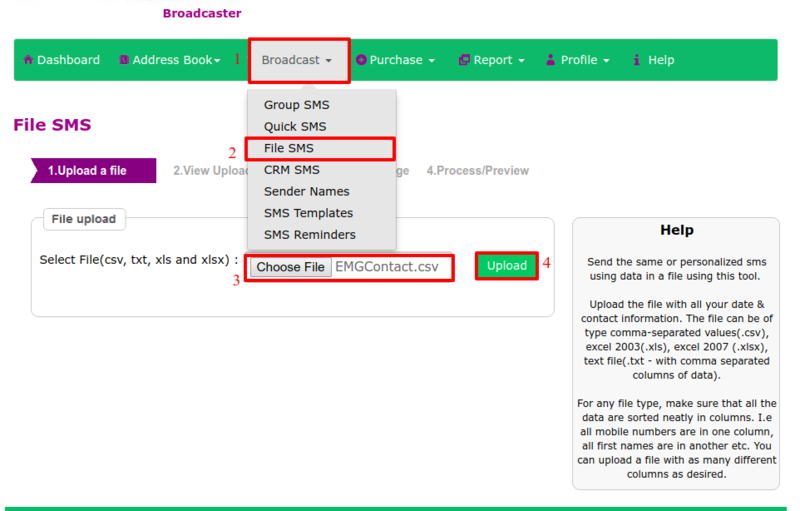 To send out sms by uploading a file (file sms), follow the steps below. Select “File SMS” in the drop down menu. 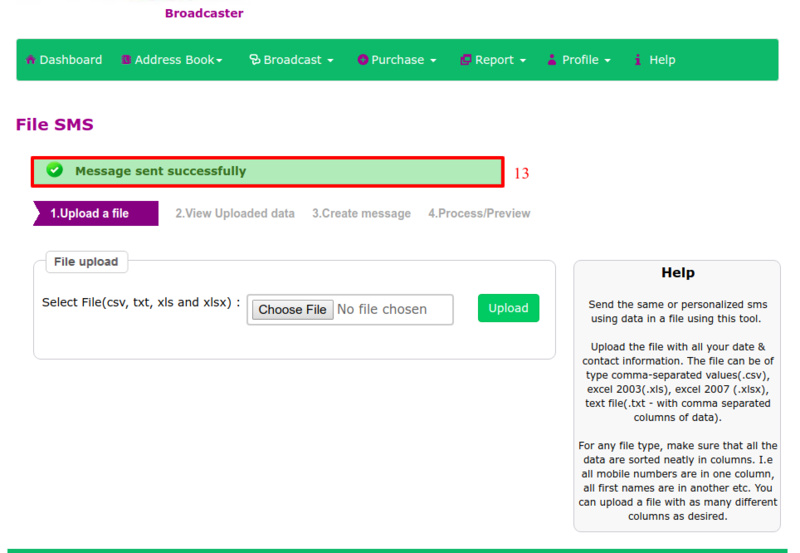 Upload the file with all your data & contact information. The file can be of type comma-separated values(.csv), excel 2003(.xls), excel 2007 (.xlsx), text file(.txt - with comma separated columns of data). For any file type, make sure that all the data are sorted neatly in columns. I.e all mobile numbers are in one column, all first names are in another etc. You can upload a file with as many different columns as desired. The order of the columns does not matter. You can view the uploaded file in the upload box to confirm it is the correct file as shown below. You will see a preview of the data uploaded from the file. 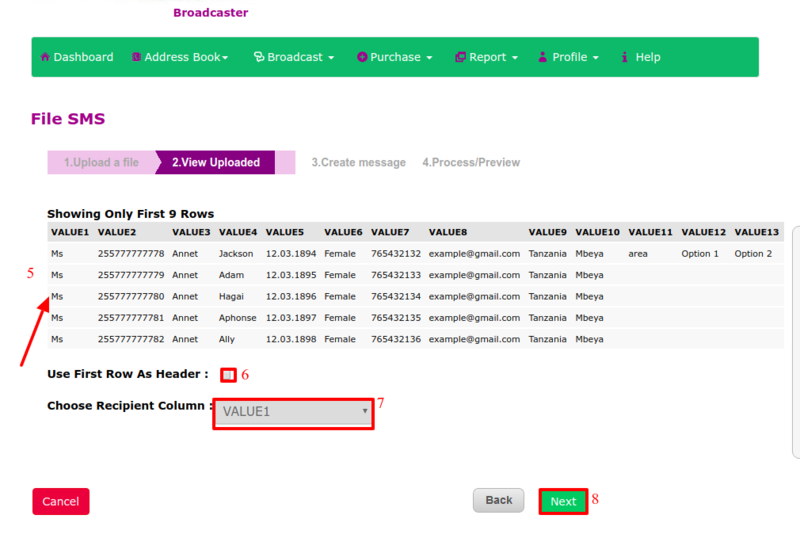 If you have column titles/headers in your file then select the checkbox for 'Use First Row as Header'. The screen will refresh to reflect the change. 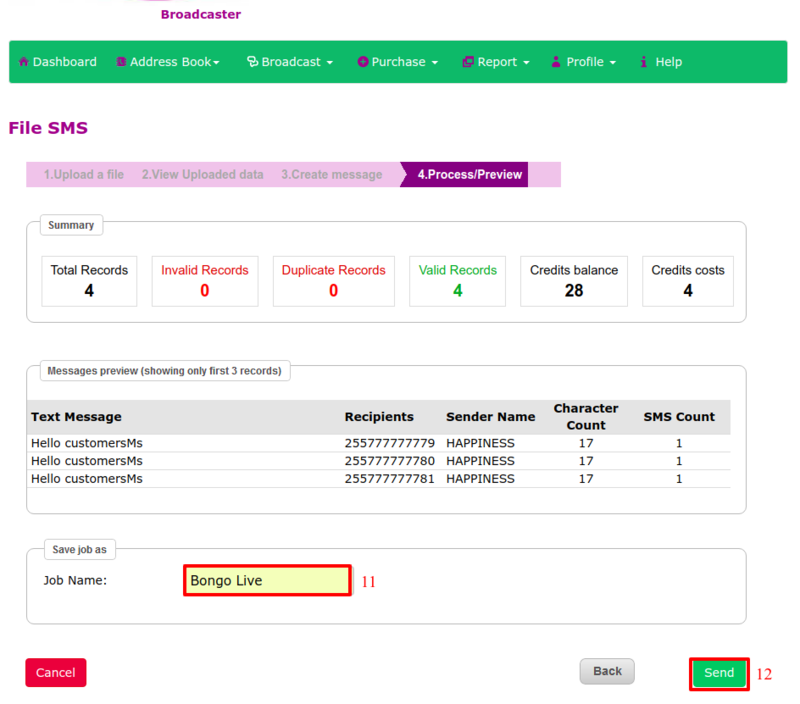 Now select the column in the drop down that has the recipient mobile numbers. Click 'Next' to proceed to creating your message. 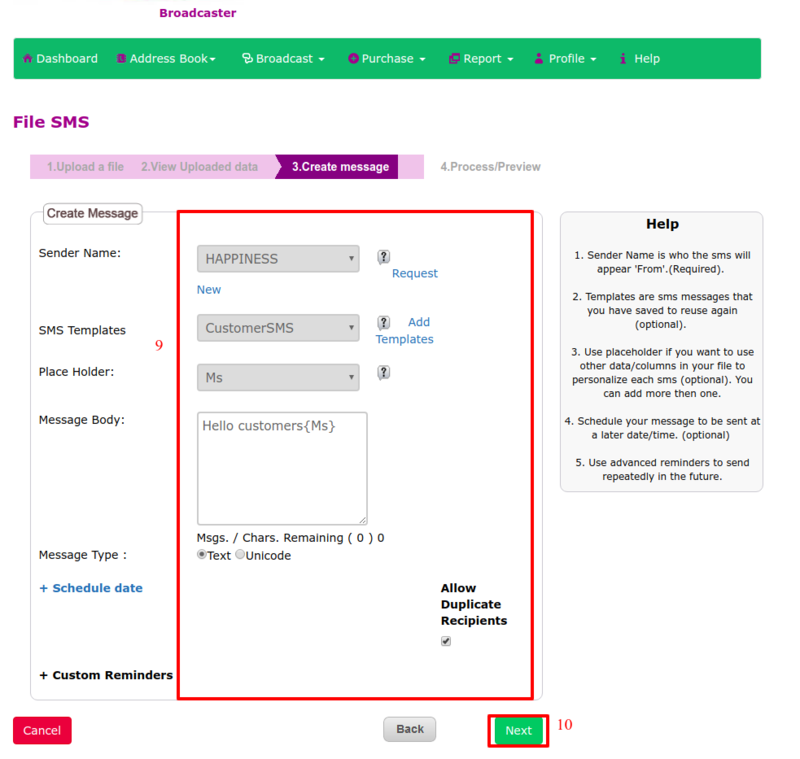 Fill in the boxes with the required information such as sender name, SMS templates, SMS reminder and so on.Templates are sms messages that you have saved to reuse again (optional). You can select a template if you have one. This will populate the message body with the template. Select your Sender Name. Sender Name is who the sms will appear 'From'.(Required). There is also an option to “Allow duplicate Recipients” in case you want to override the ‘Duplicate’ mobile numbers validations. Once you’re done click “Next”. After clicking “Next” button from the previous step, you will see a preview of the sms broadcast to be sent. A few sample records will be displayed including a summary of credits to be used and invalid/duplicate contacts (if any) that were excluded. Fill in the Job Name in the box as shown below. Once done click “Send” button. Then you will get a notification message "message sent successfully".